We are committed to helping writers and editors receive the information they need in a timely manner. Please contact events@townofeagle.org for photos or any additional materials you may need. Seasonal press kits can be found below. Summer in Eagle means longer days filled with sun and fun. 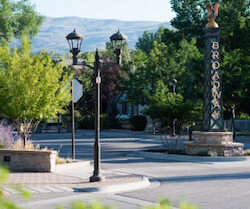 It signals the beginning of favorite town events like ShowDown Town and Yoga in the Park. We celebrate our bike and outdoor culture with Eagle Outside Festival then we commemorate our roots during Eagle Flight Days. Eagle is the perfect summer basecamp. Eagle is a high-desert town… code for an extended biking season and trails that are open into mid-December. Over 100 miles of single track mountain biking trails and paved recreational trails all accessible from your hotel room, campsite or downtown pub. Just minutes from Interstate 70, bikers will experience a verity of mountain terrain from winding high-desert single track to aspen groves and dense fragrant evergreen forests. Construction of the new in-stream features 3 & 4 of the Whitewater Park are complete and are open for use this spring and summer. The Eagle River Park will improve and conserve natural areas, open spaces and wildlife habitat, protect and improve water quality of the Eagle River, including enhanced river access and whitewater amenities. 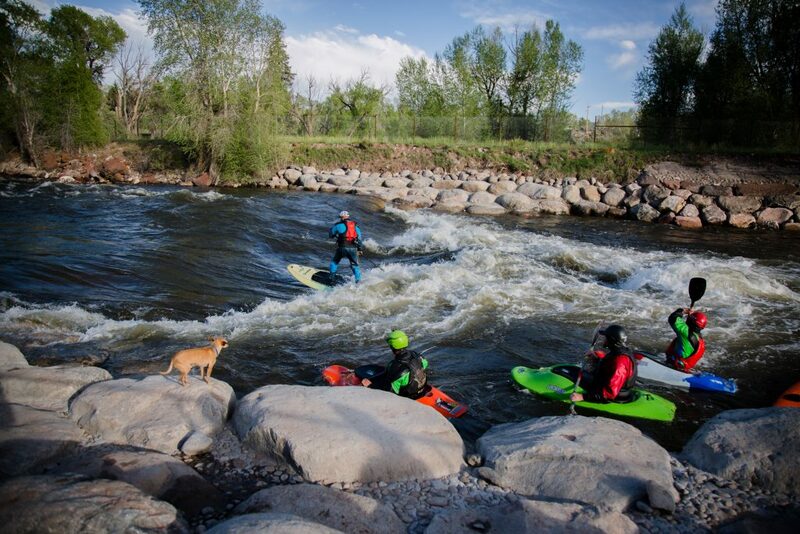 The Town of Eagle is exited for the progress made on this world-class whitewater park and recreation amenity that will serve community members and provide a venue for whitewater competitions, community events and enhance visitors to the area. Next time you’re on I-70 looking for an amazing Colorado leaf peeping opportunity, Exit at Eagle. Eagle, CO is located just off I-70 Exit 147, between the towns of Vail and Glenwood Springs. Eagle offers 100 miles of singletrack through December, stunning views of changing aspens at Sylvan Lake, and a leafing loop that rivals most Colorado destinations. Heavenly temperatures, changing trees and mountainous landscapes saturated with fiery reds, oranges and yellows are just some of the benefits from tuning up your bike this fall. Get up close and personal with the season’s color spectacle while filling up your lungs with crisp Colorado air. Eagle offers a multitude of recreational access for snowy adventures. It’s the perfect basecamp to experience winter in the mountains or affordable dining and lodging for Vail Valley ski trips. Experience the spectacular views of wintery peaks from Eagle this season. The light snow cover in town, coupled with mild temperatures, make for perfect winter trail adventures. Eagle’s friendly mountain town vibe and outdoor culture will make you want to kick your feet up and stay awhile. Eagle offers a perfect place to hang out on your way to or back from any wintery escapades up and down the Vail Valley. Returning from a 10th Mountain Division Hut trip or any trail adventures are within walking/running/riding distance to the quaint downtown area and local brewers. Wind down from adventures in the backcountry or the slopes with a refreshing craft beer at Bonfire Brewing or 7 Hermits Brewing Company. The adventure mountain town vibe can be found all over the west, but what makes Eagle culture stand out is the dedication to fostering a love of the outdoors with its trailhead at your front door vibe. Even in the heart of winter, snowshoeing, cross-country skiing, fat-biking are accessible from downtown. Elevation Outdoor’s acknowledges this when choosing Eagle as a top adventure town in 2017. Christmas on Broadway happens every year on December 2nd. The community comes together to kick off the holidays with a parade, bonfire, and of course a visit from Santa Claus. Looking for a basecamp to experience spring in the mountains or affordable dining and lodging for your mud season mountain adventures? Exit at Eagle, CO located just off I-70 Exit 147, between Vail and Glenwood Springs. Eagle offers a multitude of recreational access for all. Eagle is a high-desert town offering an early riding season and trails that are open April 15th. Over 100 miles of single track mountain biking trails and paved recreational trails all accessible from your hotel room, campsite or downtown pub. Just minutes from I-70, riders have the chance to experience a variety of mountain terrain from winding high-desert single track to aspen groves to the evergreen forests. Whether you’re out for a 5k run or a 50-mile backcountry loop, Eagle is a great location for its trail running scene. Many of Eagle’s accessible from town hiking and mountain biking trails are well suited for trail running, like: Haymaker, Boneyard, Mayer Gulch, Riddle, The Wall, Bailey Trail, Turniphead, 2nd Gulch, 3rd Gulch, Abram’s Ridge and Abram’s Gulch. The Vail Recreation District hosts the 11k Boneyard Boogie in Eagle as of the kick off race to its renowned La Sportiva Trail Running Series. The new Eagle River Park is on track to open phase 1 in April 2018. The Town of Eagle will have a world-class whitewater park and new recreation amenities that will serve community members and provide a venue for whitewater competitions, community events and enhance visitor’s experiences to the area. The picturesque Eagle River runs through the middle of the Town of Eagle and provides limitless recreational opportunities, including rafting, kayaking, standup paddling, fishing, tubing and more. A boat ramp constructed at Eagle’s Chambers Park allows boaters easy access to whitewater adventures from float trips to exciting rapids right from town. Visit a Brewery, have a coffee, dine at one of the restaurants, shop while walking around downtown or unwind after your exploration and adventures. Spring in Eagle means longer days filled with sun and fun. Eagle signals the changing of the seasons with nearly every weekend pack with events like Trail Jam celebrate the re-opening of our Open Space trails. We celebrate our bike and outdoor culture with Eagle Outside Festival and the Bonfire Blockparty, then we commemorate our roots during Eagle Flight Days. Eagle is conveniently located off I-70 in the Vail Valley, but moments after taking Exit 147 you’ll find yourself surrounded by picturesque views and a vibrant mountain community. Below is our recommended shotlist and a selection of some of our favorite shots of Eagle. To request a hi-res image from the gallery below or from our library please email us at events@townofeagle.org. Tucked into the mountains, Sylvan Lake is a scenic 15-mile drive outside the Town of Eagle. Once you arrive at the State Park and setup camp, enjoy one of the many outdoor activities offered – hiking, mountain biking, boating, paddle boarding, kayaking, canoeing, off-roading or just enjoying the view. A trip to Eagle wouldn’t be complete without time in the Eagle River. A good time is waiting whether you seek relaxation, adventure or adrenaline. Take a step back in time and access the backcountry surrounding Eagle on horseback. Horseback riding is allowed on all Town of Eagle Open Space and BLM trails. The spirit of the west shines front and center at the 78th Eagle County Fair & Rodeo. Eagle is the quintessential mountain town. With its high-desert climate, mountainous landscape and position away from the hubbub of city life, Eagle is a wonderful place to live. Fishing the lush waters in and around Eagle is a year-round sport. The vast meadows and mountain peaks always serve as your backdrop in both the snow and sunshine. The Western Slope of Colorado is home to a myriad of outdoor activities including hunting, fishing, rafting, stand up paddle boarding, kayaking, camping, atv riding, hiking, biking and more! Those of us that live here recognize that these activities help to create the fabric of our amazing mountain lifestyles. We also recognize that visitors travel from all over the world to experience the beauty of our Western Colorado backcountry. It is time to celebrate that heritage with the Inaugural Western Colorado Outdoor & Sportsman Expo coming to the Eagle Fairgrounds the weekend of April 12th – 13th. Featuring exhibitors, vendors, seminars and more, the event’s focus will be on Colorado’s hunting and other outdoor activities, as well as showcasing education, gear, equipment, guide services and more. Attendees coming to this unique event will learn how to take advantage of all the Colorado backcountry has to offer. Get more info at www.westcoexpo.com. Downtown Eagle will be buzzing this Friday evening as we present April’s 2nd Friday ARTwalk on Broadway!!! With ARTSPaCE workshop+gallery and the VVAG Gallery as the main hubs for ART, please also check out the artisan wares at Alpaca Yarn Shop, professional Photography exhibition at Vail Valley Real Estate, the new mobile boutique Cotton & Co., and Petals of Provence Flower Shop’s new location at 4th & Broadway, just to name a few…. Please see the April ARTwalk Flyer for more info. And follow @artspaceworkshop @artwalkonbroadway @broadwaystreeteagle on Facebook & Instagram We will be posting sponsors & specials all week! 15aprAll DayTrail Jam 2019!Run, hike, bike and explore! Celebrate the re-opening of our Town of Eagle Open Space trails with specials all over town. Share the stoke! Take your photoson the trails and tag #trailjam & #eagleeveryweekend & #eagleoutside on Instagram, Twitter or Facebook! New to the area? Purchase a Mountain Bike Eagle trails guide book here. 15aprAll Day162019 Trail Jam - Trails Open for Season!Bike, hike, run & ride - spring is here! Celebrate the re-opening of our Town of Eagle Open Space Trails with rides, hikes, runs and specials all over town. 27apr12:00 am11:59 pmMelee in the Mountains Roller Derby10th Mountain Roller Dolls in action! Roller Derby action in beautiful Eagle, CO. If you have never seen Roller Derby, this is the event. It’s time to clean the closets, garages, basements and the yard, and to lend a hand in picking up trash around town. Unwanted trash accumulates during the winter months and becomes visible once spring awakens. Bring your unwanted trash and recyclables to the Eagle Community Clean-Up Day and deposit them in the appropriate dumpster behind the Capitol Theater in Eagle Ranch Village. This year we will be collecting E-waste for a fee. Bring your electronics to the Clean-Up where Blue Star Recyclers will be on site to collect and dispose of your e-waste properly. There will be NO collection of Hazardous Household Waste at this event. Please click here to learn more about how you can dispose of this waste. Eagle Community Clean-Up Day is sponsored by the Eagle Ranch Association and the Town of Eagle in cooperation with the Eagle Chamber. Join in the community spirit and create a team to clean parks, trails, walkways and sides of roads. Help educate our young on the value of community involvement. Let’s keep our beautiful town clean!